The Murder at the Vicarage was the first Christie I have ever read, and although this was a long time ago, my recent re-read of this book still held the same enchantment as my first encounter with the book. There is something fabulous about this book that makes is quite different from Christie’s other books, and I still can’t put my finger on what it is that makes this one so special (other than a slight twinge of nostalgia of discovering Christie for the first time). ‘It is a pity that I am such a shocking housekeeper,’ said my wife, with a tinge of genuine regret in her voice. I was inclined to agree with her. My wife’s name is Griselda— a highly suitable name for a parson’s wife. But there the suitability ends. She is not in the least meek. They were such a lovely couple and Griselda seemed the kind of young woman with gumption that make Christie both fun and modern in her time. However, as some of you may recall, one of my main peeves with Christie is that she seems to have a problem with modern attitudes, and whilst I enjoyed Griselda’s character, I could not help but notice during this re-read how often she is being patronised. It’s not just her husband who attributes her youth with naivety, but also the other villagers, especially one old biddy, which makes me question my perception of Christie’s attitude towards young(er) characters. I mean, in her later novels, her high-Edwardian morals become problematic because they are so disconnected from the time she wrote in, but I (apparently wrongly) assumed that her earlier books did not have this problem. ‘Don’t you think,’ said my wife, ‘that Miss Cram may just like having an interesting job? And that she considers Dr Stone just as an employer?’ There was a silence. Evidently none of the four ladies agreed. Miss Marple broke the silence by patting Griselda on the arm. ‘My dear,’ she said, ‘you are very young. The young have such innocent minds. 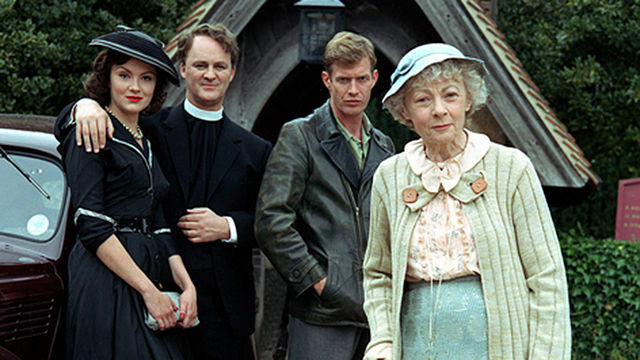 As most of you know by now from my other Marple reviews, I don’t like her as a character. That does not change my love of the book as whole, however, which is such a perfect construct of suspense, tight plot, and that little bit of satire of the English village. Miss Marple always sees everything. Gardening is as good as a smoke screen, and the habit of observing birds through powerful glasses can always be turned to account.